With 50% of European Internet users researching online data to book their leisure trips, the Internet has become one of the most important information sources for European travel worldwide. This is the result of a survey carried out by the Forrester Research firm. This predominance of the Internet as favoured information source is such that among European Internet users, it is as much as 30 to 60% of them who use the Internet to get travel information. As a result, the Net usually takes the lead or lies equal with magazines. And yet, the sales that are made online still prove way behind the sales that are made in offline agencies. Indeed, only one Internet user out of ten, among those who researched travel information online, bought travel online in the last three months. The paradox is that Internet users keep on favouring the offline network to book their trips, to the detriment of online travel agencies. 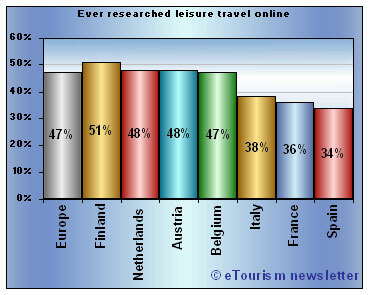 Indeed, the eTourism sector remains the first Internet sector in terms of value (due to the fact that the average cart is higher than in other sectors), but it also looks as if eTourism web sites often fail to convert enough lookers into buyers (see to that respect our New web site entirely dedicated to this new problematic: eShopability). Nevertheless, this on/offline disparity varies according to the different European countries. First of all, as far as research on the Internet is concerned, Northern European countries get much higher percentages than Southern European ones. 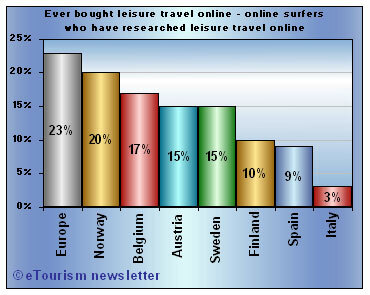 This is how we see that in Spain, the percentage of Internet users who research leisure travel information online is almost twice as low as it is in Sweden (34% to 60%). But these disparities prove even bigger among Internet users who researched travel information online and those who actually bought travel on the Internet. For instance, we can notice here that Sweden is no longer part of the top 6 European countries classified according to this criteria, when the United-kingdom gets a very good result: 43%. 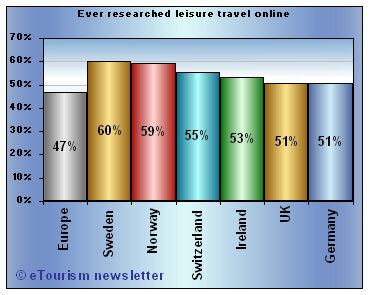 As for Sweden and Norway, they find themselves relegated to the last European countries in terms of online reservations. Please also note the very big gap that exists between the European countries as a whole and the Southern ones: Spain and Italy (more particularly the latter) get extremely low percentages. 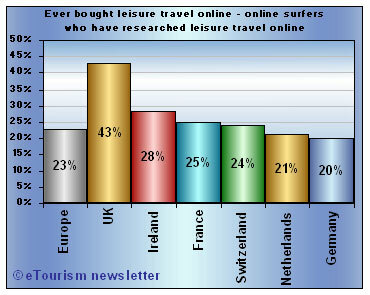 These figures well demonstrate that European eTourism still represents a huge potential. And yet, these figures also bring out the fact that many web sites do not prove able to convert their lookers into buyers.